Information regarding the contents and levels of metals in this product is available on the Internet at www.aapfco.org/metals.htm When applied as directed, this product meets the guidelines for metals adopted by the Association of American Plant Food Control Officials. It is violation of Federal law to use this product in a manner inconsistent with its labeling. For outdoor use around the home only. STOP Do not apply this product in a way that will contact any person or pet, either directly or through drift. Keep people and pets out of the treated area during application. Do not allow people or pets to enter the treated area until sprays have dried. Do not apply directly to or near water, storm drains, gutters, sewers or drainage ditches. Do not apply within 25 ft of rivers, fish ponds, lakes, streams, reservoirs, marshes, estuaries, bays and oceans. Do not apply when windy. To prevent product runoff, do not overwater the treated area(s) to the point of runoff or apply when raining or when rain is expected that day. Avoid spray drift onto vegetables, flowers, ornamental plants, shrubs, trees and other desirable plants since injury may result. Do not spray where grass is emerging from dormancy. Do not apply to newly seeded lawn grasses until well established. Do not spray when temperature exceeds 85°F. Seed can be sown three to four weeks after application. Do not use on carpetgrass, dichondra, closely mowed bentgrass, or on lawns where desirable clovers are present. This treatment may cause temporary injury (chlorosis or slight yellowing) to St. Augustinegrass and centipedegrass; however, this discoloration will disappear seven to 10 days after application. Do not use this product on Floratam variety of St. Augustinegrass in Florida. Do not spray roots of trees and ornamentals. Do not exceed specified dosages for any area; be particularly careful within driplines of trees and other ornamentals. The maximum application rate to turf is 0.6 lb 2,4-D acid equivalent per acre per application per site. The maximum number of broadcast applications per treatment site is two per year. Wait a minimum of 30 days between the two applications. Black medic, buckhorn, burdock, chickweed, chicory, clover, dandelion, dock, English daisy, ground ivy, healall, knotweed, lambsquarters, mallow, morning glory, oxalis (woodsorrel), pigweed, plantain, poison ivy, poison oak, purslane, ragweed, red clover, speedwell, spurge, stitchwort, wild carrot, wild clover, wild garlic, wild lettuce, wild onion, yarrow and many other broadleaf weeds. To BEGIN spraying, point nozzle toward treatment site and pull switch backwards with thumb towards hose connection. Water will automatically mix with the product. To STOP spraying, push switch forward with thumb toward nozzle. Turn water off at faucet. To relieve pressure before removing nozzle from hose, pull switch backwards with thumb towards hose connection until water stops spraying. Place in cool area away from heat, sunlight or open flame. NOTE: Do not use on Floratam variety of St. Augustinegrass in Florida. If you are unsure as to what type of grass you have, contact your county extension agent. 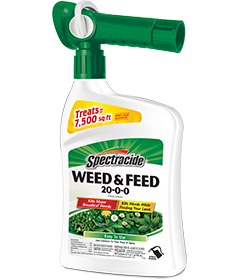 Spray any time during the growing season when weeds are actively growing. Do not treat St. Augustine or centipedegrass during periods of heat stress (high temperatures) or drought stress. For best results, thoroughly water lawn one to two days before treating. Do not treat when air temperatures exceed 85°F or damage to grass may occur. Do not water within 24 hours after treatment. Poor weed control may result if spray is applied just before rain. On new lawns, wait until the grass has reached a height of 2 inches before treating. Wait three weeks after treatment before seeding or planting stolons in the bare spots. Avoid sprays that are too fine because they can drift and damage other plants. If certain tough weeds are not dead within three weeks, spot treat. It will take about 20 minutes to apply this bottle. Actual time will vary depending on water pressure. A lawn will typically utilize 1 to 4 lb of nitrogen per 1,000 sq ft each growing season. When used as directed this product will supplement your regular fertilizer by providing 0.06 to 0.10 lb of nitrogen per 1,000 sq ft. Please contact your local Extension Office for questions regarding a regular fertilizer program. Disposal: If empty: Nonrefillable container. Do not reuse or refill this container. Place in trash or offer for recycling if available. CAUTION. Harmful if absorbed through skin. Causes moderate eye irritation. Avoid contact with skin, eyes or clothing. Wash thoroughly with soap and water after handling and before eating, drinking, chewing gum, using tobacco, or using the toilet. Wear long-sleeved shirt and long pants, socks, and gloves. Remove and wash contaminated clothing before reuse. If person is not breathing, call 911 or an ambulance, then give artificial respiration, preferably by mouth-to-mouth, if possible. Have the product container or label with you when calling a Poison Control Center or doctor, or going for treatment. You may also call 1-800-917-5438 for emergency medical treatment advice. This product is toxic to fish and aquatic invertebrates and may adversely affect non-target plants. Drift or runoff may be hazardous to aquatic organisms in water adjacent to treated areas. To protect the environment, do not allow pesticide to enter or run off into storm drains, drainage ditches, gutters or surface waters. Applying this product in calm weather when rain is not predicted for the next 24 hours will help to ensure that wind or rain does not blow or wash pesticide off the treatment area. Rinsing application equipment over the treated area will help avoid runoff to water bodies or drainage systems.